The thermocouple is one of the oldest and most widely used components for measuring temperature. 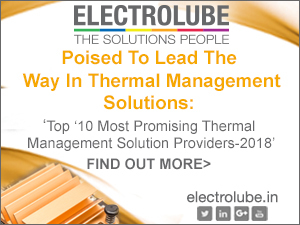 Thermocouples are generally found in applications that require temperature measurements in hostile environments, such asboilers, ovens, and automotive and petrochemical applications, to name a few. A thermocouple is capable of measuring temperatures in the range of -200°C to +2500°C, and they more rapidly respond to changes in temperature than other sensors. Shock and vibration immunity is another reason why thermocouples are so broadly deployed. So, what is a thermocouple? 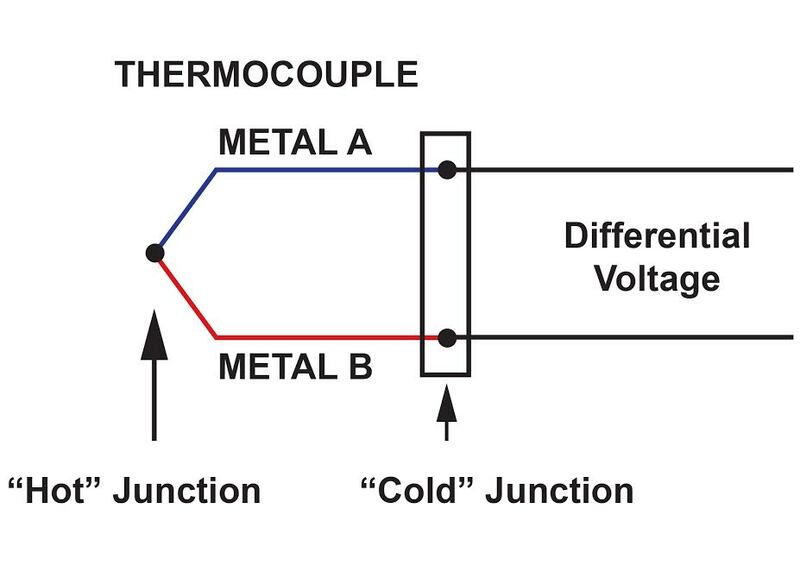 A thermocouple consists of two wires made of dissimilar metals, joined together at one end. The joined end is typically referred to as the “hot” junction, while the open end is called the “cold” junction. The differential voltage between the two wires is used to calculate the temperature at the hot junction, as shown in Figure 1. All thermocouples must measure microvolt-level signal changes. The most common thermocouple types are J, K, and T, and their room-temperature voltagesvary at 52 µV/°C, 41 µV/°C and 41 µV/°C, respectively. Because their voltage signal is very small, it can be difficult to extract from the system noise. Also, the thermocouple output is not linear over temperature, requiring the use of high-order equations to accurately calculate the temperature. Furthermore, a thermocouple measurement is only as accurate as its cold-junction temperature measurement, adding more complexity to an already complex system. 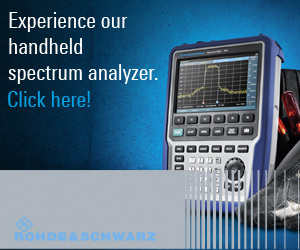 Generally, thermocouple signal conditioning is the largest investment in a thermocouple solution. Today, there are many solutions for measuring the cold-junction temperature, such as RTDs, thermistors and silicon-based IC temperature sensors. Thermistors have fast responses and small packages, but they require linearization and have limited accuracy over wide temperature ranges. They also require current for excitation, which can produce self-heating and increases power consumption,thus limiting their use in many portable or battery-powered applications. 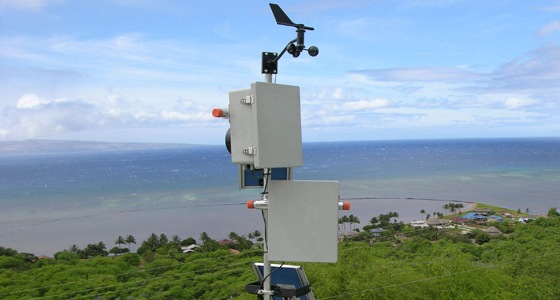 Resistance temperature-detectors (RTDs) are accurate, stable and reasonably linear devices. However, package size and cost restrict their use in many applications. 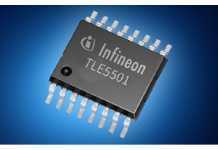 Silicon IC temperature sensors now have temperature accuracies better than 0.5°C. 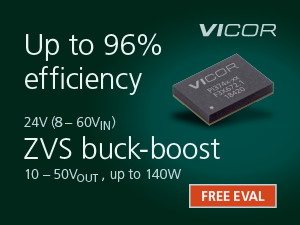 Silicon ICs are simple devices, and require minimal external circuitry or thermal design knowledge to implement. This simplicity, along with improved temperature accuracy, has increased the popularity of these devices in recent years. 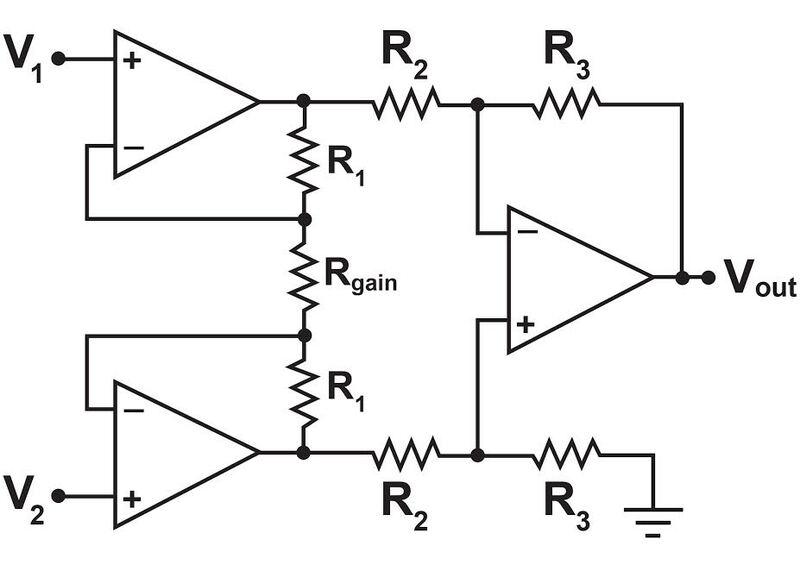 The gain of this circuit is set with a single resistor Rgain. Though this topology can achieve common-mode rejection (CMRR) above 80dBat DC, the CMRR dramatically degrades as frequency increases. 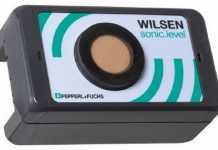 This can be an issue if one of the objectives for this device is to reject high-frequency noise. 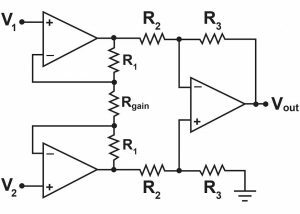 There are considerations for using the single-resistor approach. The internal resistors are trimmed to a ratio, rather than an absolute value. Not knowing the absolute value of the internal resistors makes it difficult to determine the gain of the circuit. The temperature coefficients of the monolithic resistors versus the external gain resistor will be different, causing additional gain error over temperature. Newer architectures sum currents rather than voltages,improving common-mode rejection at higher frequencies. 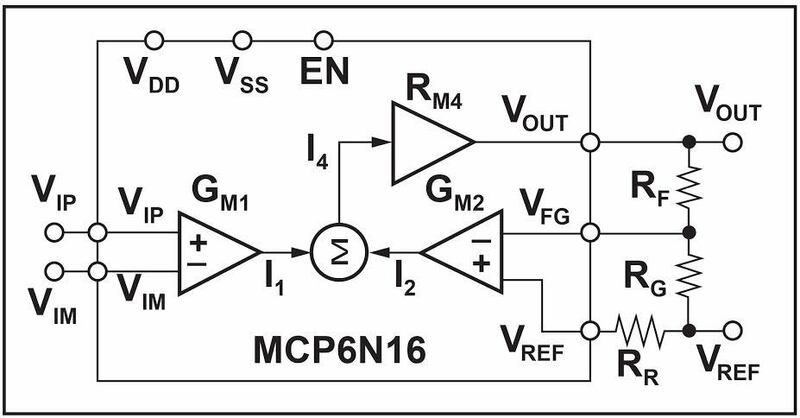 An example of this is Microchip Technology’s MCP6N16, which is shown in Figure 3. 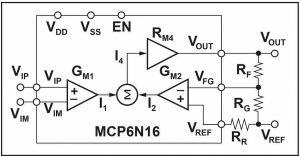 This architecture generates currents that force a voltage across RG equal to the differential voltage from VIP to VIM. Notice that the gain is set using two external resistors, eliminating the previously mentioned concerns with the single-resistor approach. 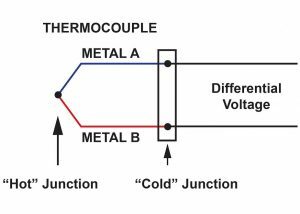 In summary, thermocouple signal conditioning is more complex than that of other temperature-measurement systems. Modern INA architectures and the advancement of silicon-based IC temperature sensors have addressed many of the historical design challenges associated with thermocouples. 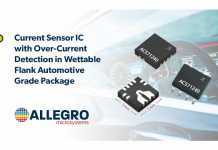 Additionally, several silicon-IC manufactures have integrated many analog, mixed-signal and temperature-sensing devices for CJC, further minimizing design efforts while improving overall system performance.